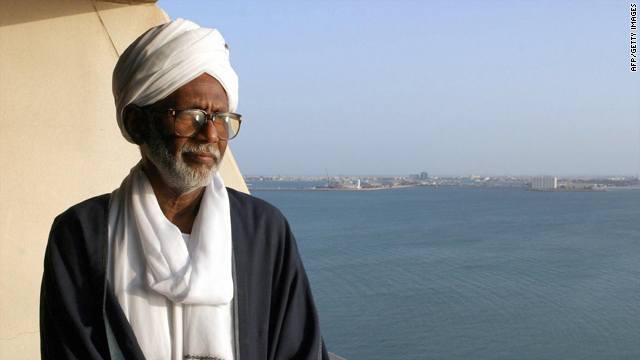 In 2000, Sudan's president ousted Hassan al-Turabi (pictured) from his post as parliament speaker. (CNN) -- Sudanese Islamist opposition leader Hassan al-Turabi -- once President Omar al-Bashir's main ally -- was arrested Saturday night, according to state media and al-Turabi's political colleagues. State-run Ashorooq network said al-Turabi, head of Popular Congress Party (PCP), was detained after remarks he made in a local newspaper criticizing al-Bashir's regime and its handling of last month's elections. Ibrahim al-Senousi, PCP deputy, said that security forces raided al-Turabi's house and detained him. His secretary, Awad Babakir, added that, "Armed security forces and intelligence agents arrived in three cars and took Dr. al-Turabi to an unknown location." Kamal Omar, PCP secretary general said, "the authorities transported al-Turabi to Kober prison in Khartoum for investigation after his arrest around midnight (Saturday)." Omar also said that military forces took over the PCP newspaper building last night and prevented journalists from entering its premises. The newspaper's editor-in-chief, Omar al-Imam, said authorities closed the newspaper Saturday night. CNN could not obtain an official statement from al-Bashir's government on Sunday. Al-Turabi has been imprisoned a few times within the last few years, the last time in January 2009. Al-Bashir seized power in a military coup in 1989 together with his then-close ally al-Turabi, who was long thought to be the power behind al-Bashir's regime. In 2000, the president ousted al-Turabi from his post as parliament speaker and stripped him of his political power. Al-Bashir accused al-Turabi of undermining his power. Al-Turabi later formed the opposition Popular Congress Party. The oil-rich African nation has been riven by fighting in Darfur and a civil war between north and south.